24th Feb –Vajra Vidhya Institute, Sarnath. 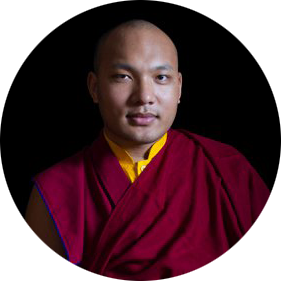 On the fourth day of the Spring Teachings the Gyalwang Karmapa turned the focus firmly inwards: if we look inside our own minds, a wishfulfilling jewel is already waiting. No matter how long we may search elsewhere for it, in the end we come back to what was already present within ourselves from the very beginning. From exploring the innermost essence of our mind, the Gyalwang Karmapa then shifted the focus back outwards again, by reminding those gathered that sometimes we need to look from the perspective of others to see the full value of our lives. Using the metaphor of a net, in which each individual life is completely connected and completely interdependent with others, we must also be able to see how others find our lives meaningful. Leaving the audience with this beautiful perspective on interdependence, the Gyalwang Karmapa told those gathered that he would continue the next teaching session with a different instruction from the ‘Tri Thung Gyatsa’ text, on devotion. The Gyalwang Karmapa’s Spring Teachings continue until February 28. In addition to the seven languages already offered, live translation is now also available in Russian.